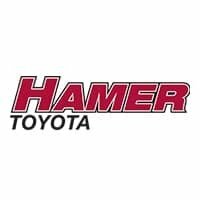 Hamer Toyota is proud to be your source for Toyota cars, minivans, SUVs, and trucks in Mission Hills and the surrounding area including Reseda, Northridge, Chatsworth, San Fernando, and Los Angeles. We are always adding new vehicles to our inventory, so you are sure to find the right vehicle with the desired specifications and configurations for your needs. When you buy a new Toyota from Hamer Toyota, you can feel confidant knowing that you’ve purchased a reliable vehicle for a great price. Our team of friendly sales people are available around the clock to answer any questions and help ensure that you have an extraordinary car shopping experience. To help you find the right vehicle for your budget, you can check your estimated monthly payments using our ‘Payment Calculator’ and research our models by browsing through our ‘Toyota Camry’, Toyota Corolla’, ‘Toyota Prius’ and ‘Rav4’ research pages. Every new Toyota purchased includes ToyotaCare, a no cost vehicle maintenance plan that covers normal factory scheduled maintenance for two years or 25,000 miles. When you make an appointment with our service department, our highly-trained technicians will help you with all your service needs. When you find the new or used vehicle that you want, please come by to check it out or schedule a test drive. If you need help with getting financing for your new vehicle, we recommend that you fill out our secure finance application so that our finance team can reach out to you. Even if you have no credit or bad credit, our team can still help you.